Please join us for the Annual General Meeting of Section 79 of the Illuminating Engineering Society - Edmonton Section (Northern Gateway). The AGM will be relatively short, with an update on the past year's activities, some future plans and elections of the board of directors. Please join the IES while we enjoy summer with a pitch & putt golf tournament this June 14th! The IES Street & Area Lighting Conference is the only conference of its kind dedicated to improving the outdoor lighting business of electric utilities and energy service companies. We continue to provide an open forum for end-users facing the same questions regarding relevant products for specific application, lighting controls, bench marks from other users in the lighting community, and milestones reached by municipalities, utilities and DOTs. We strive to maintain a small community feel, creating a great opportunity to network with industry peers through seminars with speaker Q+A, breakout sessions to discuss issues in-depth, an exhibit hall and many networking events with speakers and peers in a comfortable and open atmosphere. This seminar will discuss lighting approaches, pitfalls to avoid and lessons learned. A case study will be presented - taking the effective lighting strategy of the Simons department store brand and converting it to a net-zero success story. Join the IES for an evening of conversation, snacks, and drinks. We'll be talking about Building Information Modelling (BIM), how it can streamline the lighting design process, and how it has evolved over the past few years. We'll also talk about modern visualization techniques that are used to digitally express your lighting design to clients. BACKSTAGE ACCESS Production Expo will be returning to the Northern Alberta Jubilee Auditorium in Edmonton from March 4-6, 2019. Mark your calendars now for two days of lighting education and networking in the heart of Canada. The building industry is seeing an increased interest in human health and well-being, notably through the development of health and well-being rating systems for buildings. This session will explore how the built environment impacts human health and will review the first health and well-being rating system to hit the market, the WELL Building Standard. The Light concept category, an integral part of WELL, will be explored in depth and includes areas such as daylight modelling and circadian rhythm analysis, which are of increasing interest to clients. Experience magic as you walk through Muttart Conservatory’s Temperate Pyramid. There will be a variety of light installations that will light up the space and transform it into a winter wonderland. 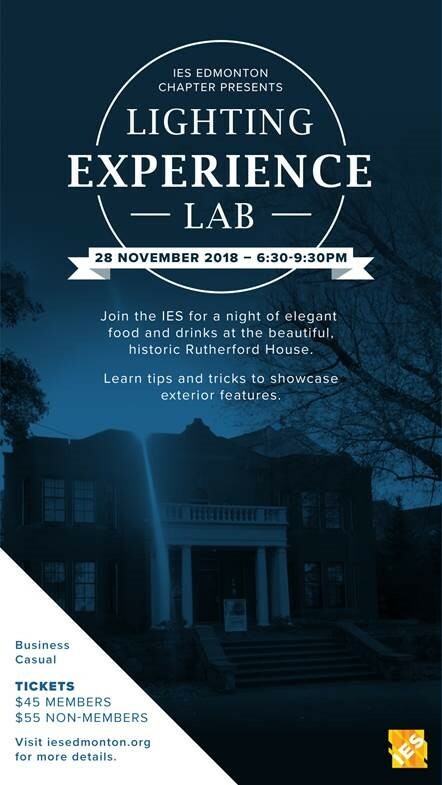 Come join the IES and enjoy an evening of great company along with snacks & drinks in the provincial historic Rutherford House. Local IES membership will provide an in-depth review of exterior lighting and landscape lighting. Learn what works and what doesn’t. Site mock-ups with various product types demonstrate examples of various lighting strategies and their visual effects. A great opportunity to network with industry members and gain some practical knowledge. Have you ever found exterior lighting mounted in the wrong place? Are you seeing glare when you don’t want to? What are the best practices to illuminate a landscape or building? How to mix shadows and light on your site. How to make the exterior look as interesting as the interior of a building. Parking available on U of A campus parking lots. Yes, just let us know when you arrive so we can keep track of the attendees. This course offers an introductory look into the many facets of lighting; from physics and biology behind vision, to sustainable design and energy efficiency. Students will learn basic terms and concepts in all of these facets. The IES Street & Area Lighting Conference is the only conference of its kind dedicated to improving the outdoor lighting business of electric utilities and energy service companies. We strive to maintain a small community feel, creating a great opportunity to network with industry peers through seminars with speaker Q+A, breakout sessions to discuss issues in-depth, an exhibit hall and many networking events with speakers and peers in a comfortable and open atmosphere. Our attendee base, over 900 and growing, includes managers, technical and marketing specialists, lighting consultants and engineers from electric utilities, municipalities, cooperatives, energy service companies and manufacturers. 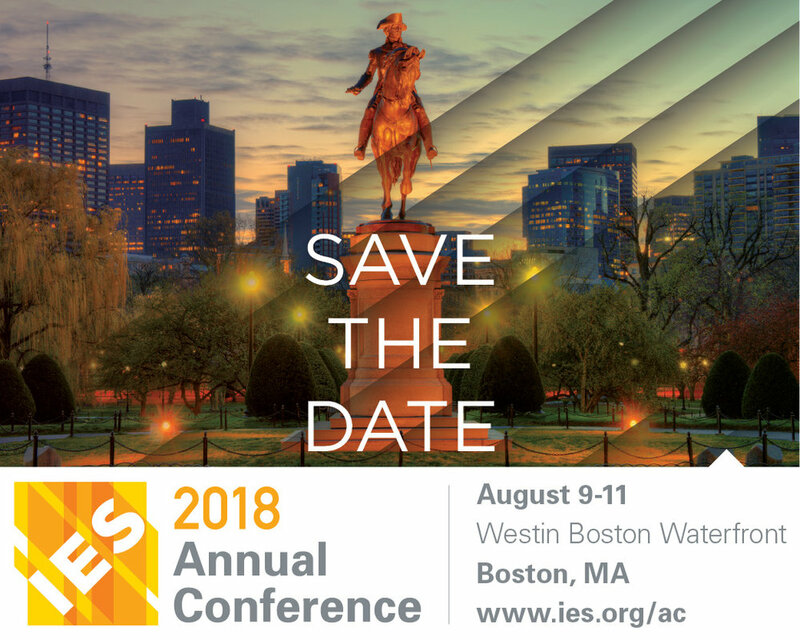 Join fellow IES members and colleagues from throughout our industry at the 2018 Illuminating Engineering Society (IES) Annual Conference in Boston, MA August 9 - 11, 2018. This year’s theme is Bigger, Better, Boston. Registration will begin after the New Year. As always, professional education is paramount. Lighting professionals will have their choice of various CEU credits through participation at the conference. This is a great opportunity to connect and interact with other local IES Sections and fellow Lighting Professionals. Attendance is open to both members and non-members. If you would like to participate on the Annual Planning Committee please contact Anastastia DeLeon at adelon@ies.org. Please join the IES while we enjoy summer with a pitch & putt golf tournament! Doors will be open at 11:30 AM with the speakers starting at 12:00 PM. A lunch will be provided – please message us after your registration if you have any specific dietary needs. Please join us for the Annual General Meeting of Section 79 of the Illuminating Engineering Society - Edmonton Section (Northern Gateway). The AGM will be relatively short, with an update on the past year's activities, some future plans and elections of the 2018/2019 board of directors. In addition to the AGM, we will have a presentation on the State of Lighting in Edmonton, featuring some of our award-winning lighting projects, some interesting lighting installations, and other lighting features in town. Again this year we will be recognizing our local section's lighting contributions with our Northern Lights awards. One winner will be presented in each of the two categories; Interior and Exterior. For simply submitting a project, there will be a prize draw, and for merely showing up and voting, there is a draw for a $100 VISA gift card. No project is too small or too big - all submissions are welcome. We request that your submissions are provided to us no later than May 15th so that we have time to incorporate the information into our AGM presentation. Full details of the submission requirements is available on our Northern Lights Awards webpage. Come find out what's illuminating our province, enjoy lunch on us, and do some networking! Election of the board for the upcoming year will be provided at the event with voting for the positions at the meeting. If you wish to become a member of the board, or would like to nominate someone for the position please let us know. All nominations known before the meeting can be sent to the IES Edmonton email account with the name and proposed board position at info@iesedmonton.org. We would like to include names of nominees with the presentation for all to see, but this is not required, as any members in attendance may also be nominated for a position on the board. Descriptions and responsibilities for the board positions can be reviewed under the IES Section Guide (PDF). We encourage all members who wish to become more involved with the local section to become general members (Managers) or Officers of the board. We are always looking for new ideas and directions that will benefit our membership. Please note - Everyone is invited to attend the meeting, but only members are eligible to vote or let their names stand in the elections - get your membership now by following the Membership links on our website. Everyone involved with and interested in the lighting industry....Why haven't you signed up yet??? Lunch will be provided for this event. Please send us a message if you have any dietary restrictions. Free Parking is available at the event venue. Yes, please check in with us when you arrive. Please contact Illuminating Engineering Society - Edmonton Section with any questions or concerns. This webinar will take participants through the different types of light spectrum control, discuss the color tuning abilities of tunable white fixtures and their design challenges and conclude with how you can reduce risk and meet your client’s sequence of operations requirements on color tuning projects. Describe the fundamental categories of spectrum control with LEDs. Analyze the color tuning features of tunable white fixtures. Identify challenges with tunable white. Evaluate the feasibility of meeting a sequence of operations with various fixture types. Participants to this webinar are eligible for one (1) IES Continuing Education Unit (CEU). Make plans now to come to LIGHTFAIR, and see for yourself why so many attendees consider it “THE gathering place for the industry.” It is the world's largest annual architectural and commercial lighting trade show and conference. Using case studies, this presentation will provide input into the evaluation of various architecture and interior spaces and show how to use lighting to enhance the overall effect and mood. When developing a lighting design, lighting specifiers determine the lamp and fixture combination that best suits the design’s requirements based on many factors. While some considerations are largely technical, such as power consumption, the amount of light generated, and how light is distributed, one consideration is both technical and artistic and can be approached in a number of ways. Participants to this webinar are eligible for one (1) IES Continuing Education Unit (CEU). Lighting plays a critical role in fostering safety, security, and a sense of welcome to residential and hospitality projects, especially after the sun goes down. Learn how historical and psychological context can inform layered and adaptable lighting design solutions for lobbies, reception areas, restaurants, and residential living spaces that result in happier humans and more dramatic architecture. Participants to this webinar are eligible for one (1) IES Continuing Education Unit (CEU). The paradox of museum lighting is that the same spectral energy used to illuminate museum displays also causes fragile materials like pigment, fabric, wood, and metal to deteriorate. This presentation will provide insight into how to utilize IES’s new Recommended Practice for Museum Lighting (RP-30-17) to deal with the conundrum of preserving light sensitive materials while providing a dynamic visitor experience. This presentation will be richly illustrated showing how to employ light so museums may be better seen, understood and experienced. Participants to this webinar are eligible for one (1) IES Continuing Education Unit (CEU). This webinar will examine the components and guidance resident in the current version of the standard. Additionally we’ll discuss proposed subject areas for the next version of this exciting initiative. Participants to this webinar are eligible for one (1) IES Continuing Education Unit (CEU). Wireless Lighting Control examines the many wireless protocols lighting control manufacturers are implementing today along with their benefits and detriments to our already crowded wireless atmosphere. These new technologies, along with their communication, are becoming vastly more popular and well adopted in the commercial space; one strictly dictated by a constantly evolving energy code. This presentation explores these protocols and offers helpful compliance paths to ease the daunting task commercial consultants face with the newest release of ASHRAE 90.1 2016. Become aware of the wireless communication protocols available to manufacturers of controls and how they differ. Discuss the benefits of wireless communication from an installation, scalability, and reconfiguration perspective. Discuss various system reliability and security related measures. Discuss ways wireless lighting control can aid in the compliance of ASHRAE 90.1 2016. Engineers and Lighting Designers, Architects and Interior Designers, Lighting Retrofit Contractors. Location: Royal Glenora Club – Edmonton. Brendan Hendel-McCarthy has been involved in engineering with Lutron Electronics since graduating from the University of Waterloo and is a Systems Applications Engineer. At UW, he earned a Bachelor of Mathematics (Computer Science) Co-op. Through the co-op program, he held a diverse range of positions in different industries having worked with contractors, end users, and lighting designers on job sites. Brendan has an impressive depth of product knowledge and a unique perspective on the design/construction process. Brendan is also a LEED Green Associate with a profound understanding of smart and sustainable building design. Yes, you can count this event as learning hours for certification renewal credits with various associations. Please confirm with your association as to how these hours can be applied, however, this seminar is not registered or accredited with any particular association. Free parking is available at the Royal Glenora Club.